Welcome to the Chemical Engineering Department at the University of Rochester! Established in 1915, the department offers a BS program accredited by the Engineering Accreditation Commission of ABET, http://www.abet.org. The department also offers a MS and PhD in chemical engineering and an MS in alternative energy. Enrollment and graduation information for our department can be found here. Our faculty and students conduct research at the forefront of modern chemical engineering. We specialize in applying materials science to tackle grand challenges facing society in the areas of clean energy, biotechnology, and nanotechnology. For post-doctoral fellowships, please contact the faculty members regarding research opportunities and openings. Last year we are celebrated the 100th anniversary of chemical engineering at the University. 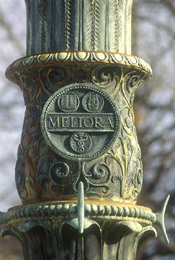 In honor of our anniversary we compiled historical snapshots and a photo guide, and hosted a ‘big birthday bash” during Meliora Weekend. Feel free to contact us with questions or to schedule a visit. To provide students with the initial foundation, knowledge, and skills they will need to become leaders in their professional careers.